Based in California, BIA Cordon Bleu has been crafting superb stoneware and porcelain dinnerware, serveware and bakeware for 65 years. From contemporary patterns to classic designs, our ceramics are created by skilled artisans to ensure the highest quality product. If you have a taste for something with a little pizzazz, BIA Cordon Bleu offers bowls and dishes with hand glazed, unique patterns and elegant designs. Our serveware is also available in a wide range of shapes and sizes to accommodate all your entertaining needs. 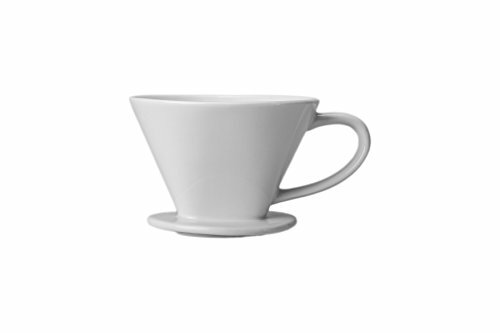 Insert your own cone filter and pour hot water over this #2 Size Pour Over Coffee Filter from BIA Cordon Bleu to enjoy freshly brewed coffee or tea. Made from high-quality white porcelain, this filter is resistant to chipping, cracking, and staining. It is dishwasher and microwave safe.